This map covers the southern part of Thirsk in great detail, including West House, maltkilns, Court House, with a good stretch of the NER Town Branch railway with station (by 1910 a goods station). A short stretch of the NER main line is shown at the west of the map with engine shed (but not station). The main feature of the map is the village of Sowerby, including Sowerby Grange, St Oswald's church, Sowerby House, with coverage extending south to Worlds End pub and Town End Bridge. On the reverse we include a directory of Sowerby plus further directory information about Thirsk. 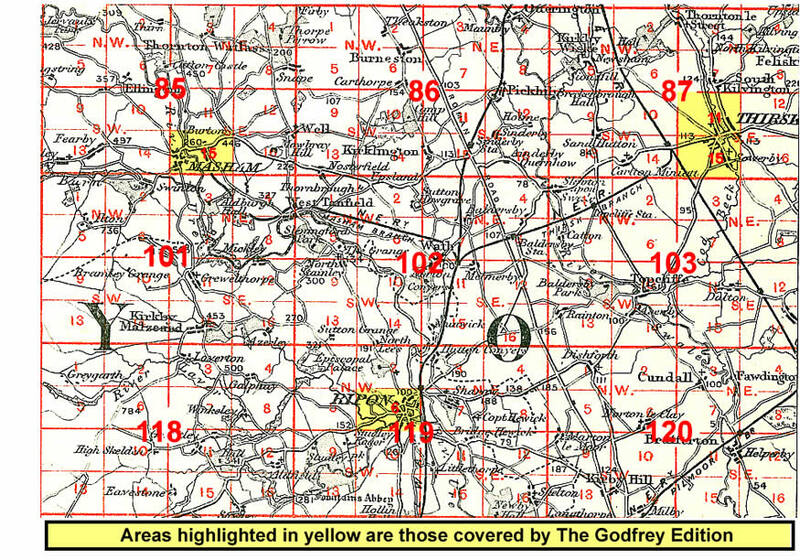 The map links up with Yorkshire Sheet 87.11 Thirsk to the north. River Skell, St Mary Magdalen's chapel, River Ure, Sharow Cross. And here is an index map showing the areas covered.